Click the button below to add the Recycled bombshell love heart earrings handmade in Cambodia to your wish list. This very special pair of earrings is made from recycled bombshells (safely sourced). 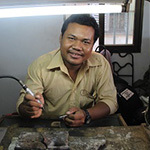 Since the fall of the Khmer Rouge, the local artisans have been transforming objects of violence into objects of beauty, which gives each pendant or earring a powerful message of peace.